It’s a new year, and we have a new version of Android. Known popularly by the code name Ice Cream Sandwich, Android 4.0 is an important update to Google’s mobile operating system. It will be available for both tablets and smartphones, and seeks to unify an Android experience that has become more and more fragmented. And that’s great. But if you own or are thinking of buying an Android device, you probably want to know more about the features. What does the new version offer that the others don’t? A new version of Android needs a new theme. Called “Holo,” the revision for Android 4.0 places an obvious priority on simplicity and elegance. It’s easily the best looking interface for an Android device to date. Google has made this theme a compatibility requirement for devices running Android 4.0. If a device does not use the theme, it won’t be able to access the Android Market. This doesn’t mean that customizations are no longer possible. It just means they must conform to the standards of the Holo theme. Doing this is an obvious effort to cut down on fragmentation of Android, and in my opinion, it’s long overdue. When Android Honeycomb was released, it offered a new multi-tasking system that featured thumbnail views of apps. This was every bit as useful as it sounds, but smartphone owners were left out. That’s no longer true in Android 4.0. Multi-tasking on all devices with the OS will take place using a thumbnail view of recently used apps. Switching between apps should now be a little quicker and a lot more attractive. The app launcher has always been one of those things in Android that makes you go “Why!?! ?” It was possible to launch apps from it – but not uninstall them. For that, you had to delve deep into the Settings menu. Folders are also now included by default in the app launcher. With the new version it’s finally possible to uninstall apps via drag-and-drop. You’ll also be able, according to official information, permanently disable apps that were pre-baked into the device. This should reduce the pain of bloatware. Notifications aren’t bad on Android devices currently, but they’re been further revised in 4.0. One of the best updates is support for app control directly from the notifications menu. If you are listening to a podcast in the media player, for example, you can pause it from notifications. Another nice extra is the ability to clear individual notifications. That was possible before – it was an all or nothing deal – but now you can swipe a single notification away. Access to the Settings menu is included by default, as well. Which makes sense, because Android 4.0 has done away with the Menu button. The lock screen How To Display Owner Information On Your Phone's Lock Screen [Android 1.0+] How To Display Owner Information On Your Phone's Lock Screen [Android 1.0+] Have you ever lost your phone? It's a sick feeling, not just because it costs a lot of money to replace (especially if it's a fancy new smartphone), but because it has valuable information like... Read More is supposed to protect your phone, but not all parts of your phone need protection. In Android 4.0, you can access the camera to snap a picture or view notifications on a locked phone. Taking additional actions from the notifications display will require that you unlock the phone as before, but you’ll now be able to check for messages or emails more easily. And since the new notifications system includes music controls, you can play, pause, or switch tracks as well. This increases convenience without decreasing security (by much). Unlimited data plans are a dying breed (at least here in the United States), so more users are concerned with data usage than ever before. Carriers aren’t always as helpful with monitoring data as they could be, so Android 4.0 includes built-in usage monitors by default. These do what you would expect. Overall data is monitored, as is the data requested by each individual app, making it easy for you to see if a particular app is hogging all of your data, or what percentage of your data is being consumed by web surfing. Oh, and the graphs themselves look cool. Most of us have at one point or another wanted to send a file directly to another phone, but had to instead use email or an instant messenger. Wi-Fi Direct solves this problem by allowing Android phones to share information directly between them using their wireless radio. 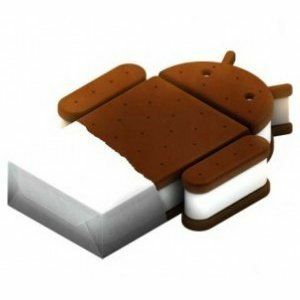 As if that weren’t enough, Ice Scream Sandwich will also let devices connect to each other using near-field communications. It’s called Android Beam, and it allows phones that are right next to each other to share data. This means you can “tap-to-share” – knock devices together to have them communicate. Google has put a lot of work into its camera and gallery apps for the new release. The default camera app now has access to things like continuous focus, face detection and stabilized image zoom, which should make it easier for users to snap quality photos. Also included is the ability to snap full-resolution photos while taking video without interrupting the recording. Besides interface changes, the gallery also includes a photo editing mode that has a number of basic options like crop and rotate, remove red eyes, adjust color balance and more. These touch-ups can be applied and then saved in place of the original photo. New effects have been added for video, too – generally goofy stuff, though the ability to change the background of a video might have real use. These are far from the only new features found in Android 4.0, but they are the features that I think most users are going to notice right away. Geeks will probably notice that a lot of these are things that you can already have on previous versions of Android, but only through the use of third-party apps. It appears Google is paying attention to the improvements made by developers. Hopefully, this is going to result in an experience that’s much better than previous versions of the operating system. I just want to know how they can call it unlimited,when after you use a certain amount they drop the speed,should it not continue at the same speed all the time,since you pay for a certain time frame,I feel,we as consumers are being being lied to,so what can we do to stop this ? Oh really!? Android notifications wasn't too bad.... I would say they are great! So. Great that ios copied it! The problem I have with updates, is that I'm losing the way I'm ordering my apps... I've updated 2 times now, and each time I must reorganize my stuff because the update resets all to "alphabetical order"... anyone as a solution for that ?? With samsung android phone you can uninstall apps from the drawer, press the menu key, press edit and then press the minus key on the icon on an app. Buy I don't know if this is samsung specific.